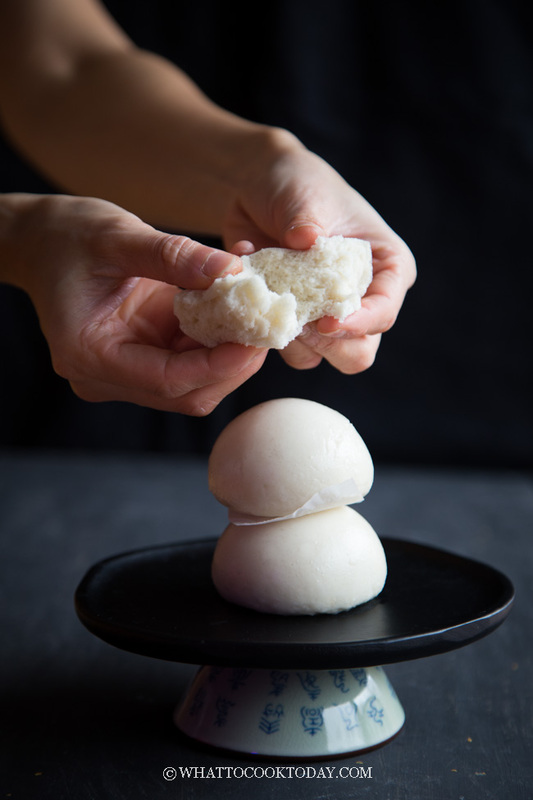 How to Make Soft Fluffy Asian Steamed Buns Every Time – You can now make soft fluffy Asian Steamed Buns at your very own kitchen and important tips you need to know to make ULTRA SMOOTH steamed buns. Soft and fluffy steamed buns are favorite and well-loved food by many across Asia. The steamed buns can be filled with nothing (plain), sweet or savory filling. Before I started cooking at the kitchen, making steamed bao was never on my list. I could easily go out and got as many as I wanted. 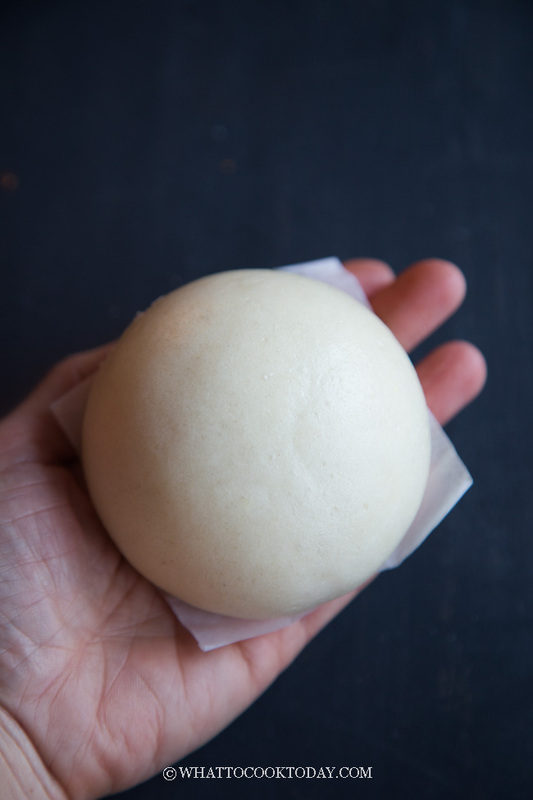 I can get soft fluffy steamed bao zi here in Minnesota too, but making them have been on the list for the longest time since I started this food blog and I finally decided to hop on it! WHAT MAKES SOFT AND FLUFFY STEAMED BUNS? *Update 12/18/18*: I prefer to use cake flour instead of the combination of all-purpose and cornstarch. The bleached cake flour gives whiter steamed buns while the unbleached cake flour gives slightly yellowish buns, but equally delicious. Before I updated the recipe with cake flour, it used to use a combination of all-purpose flour and cornstarch. 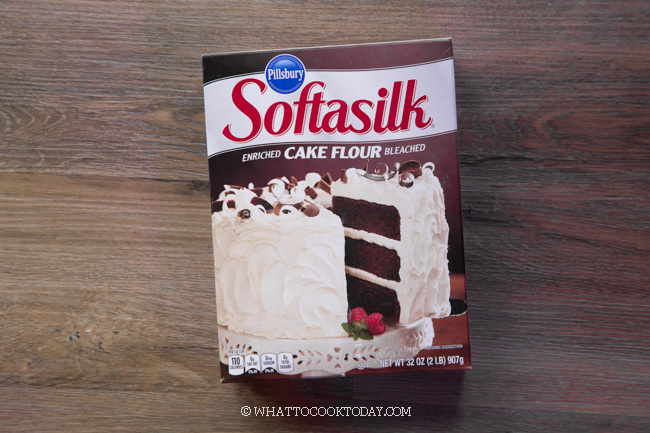 While they are soft, but everyone in the family loves the cake flour version. It’s softer and more cake-like and not spongy and airy. 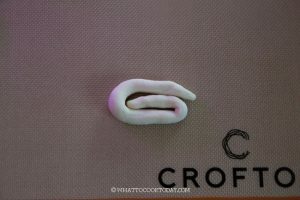 This is just the example of the cake flour I use. You can use whatever brand of cake flour you like. I remember back in my grandma days when stand mixer or bread maker wasn’t available yet, the big bulk of the task of making soft fluffy and smooth steamed buns lie on the kneading the dough. Lots of kneading! If you have a stand mixer to knead the dough for you, then that’s really good! There are so many kinds out there and the naming can be quite confusing. I’m not going to elaborate about yeast here, but just to share with you what you need to know within the context of this post. FOR THIS RECIPE (low sugar content): I like this SAF Instant Yeast (Red Label). This instant yeast can be used for all kind of doughs, from bread, steamed buns, to refrigerated or frozen dough. It works very well. It’s suitable for dough that is not sweet. This recipe only calls for 3 teaspoons of sugar per 300 grams of flour. IF YOU PLAN TO INCREASE SUGAR AMOUNT: Yeast can thrive with a bit of sugar, but too much sugar can inhibit their activities. If you plan to use the amount of sugar of 10% or more of the flour weight (10% of 300 grams is 30 grams of sugar or more), use this SAF Instant Yeast (Gold Label). It works so much better for sweet dough. You can definitely use whatever instant yeast or even regular active dry yeast if you like, just know that once you increase that sugar amount, the yeast will work much slower and will take much longer to proof the dough. But wait, you used to say that we must proof the steamed buns TWICE! The first proofing in this recipe is to let the yeast to do its work by fermentation and leavening the bread. The second proofing is to punch out most of the air created by first fermentation and also to let the yeast does its work again. This will help the steamed buns to hold its structure later. While there are some truths to that statement, proofing the dough twice does make the dough stronger and more resistant to collapsing due to temperature changes, BUT, I found that no matter what I do, if I overproof the steamed buns, they come out not smooth, even when the buns appear to be smooth when I shape them!. In conclusion, ONLY PROOF THE DOUGH ONCE! This is the part that really helps to achieve that ultra smooth and “tall” steamed buns. I learned about this shaping technique from a youtube video by Michael Lim. A lifesaver!! I have made steamed buns for A LOT in the past few months and I’ve learned from some of the flops to share with you and hopefully, you don’t have to go through the same. 1. WHY DO HOMEMADE STEAMED BUNS ARE YELLOWISH IN COLOR? This is the question I was asked often when it comes to making steamed buns at home. If you use the premixed steamed buns flour that you bought from the store, the result usually is white in color. The answer is because of the flour. The flour has been treated or bleached to give you that white result. I like to use bleached cake flour (low gluten content). 2. DOES ADD VINEGAR TO THE STEAMING WATER HELP TO WHITEN THE STEAMED BUNS? I tried that before several times and the answer is No. I thought it would work some magic, but it didn’t happen. 3. DO WHITE STEAMED BUNS TASTE BETTER? Not necessarily. Don’t let the color fools you. Just because you produce some yellow buns, they can still be soft, fluffy and delicious! The color doesn’t really affect the taste. Yes, over proofing is a problem too. When you let it proof for too long, it will weaken the dough and when you steam it, it will collapse and cause that wrinkle and the buns will spread to the side making them look wide and flat. Make sure you push all the air bubbles out after the first rise. Re-knead the though few times and then shape the buns. Make sure the surface of the buns are smooth or they will come out well..not smooth after steaming. When I steam the buns over medium-high heat, they always come out wrinkly. But once I adjust the heat to medium-low (almost low), the buns come out smooth. This is less likely the cause for severe wrinkles on the steamed buns, but the sudden change in temperature may sometimes cause the steamed buns to retract and sometimes even collapse and shrink causing the wrinkles once they cool down completely. Let them stay in the steamer for 3 minutes after you turn off the steamer. -Another culprit usually is the filling inside the buns. Too much moisture in the filling will make the bun wrinkles and collapse too. 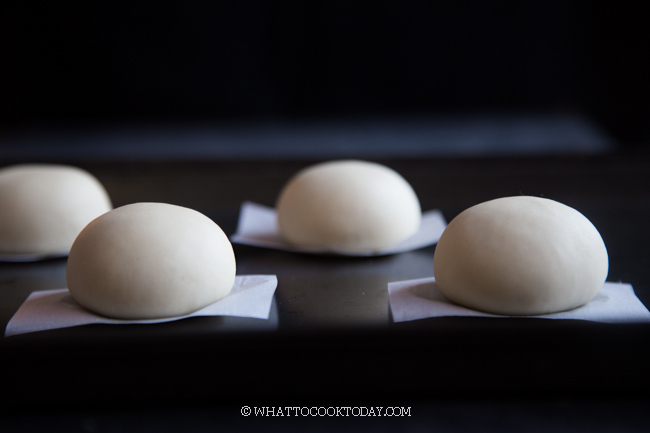 WHAT CAN YOU EXPECT FROM THIS SOFT FLUFFY ASIAN STEAMED BUN RECIPE? 1. 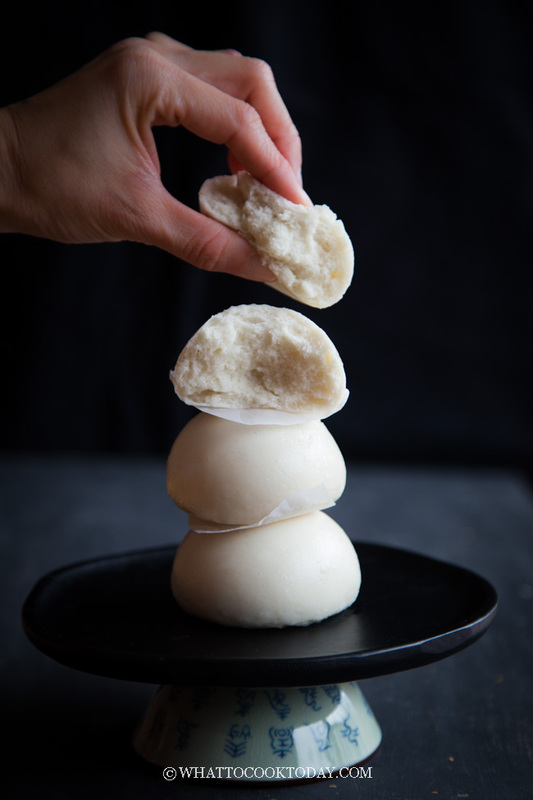 If you stick to the instructions, you should be able to recreate these soft fluffy steamed buns at home every time and ULTRA SMOOTH TOO! 2. The steamed buns are soft, fluffy with cake-like texture. Storing: If you make extra and plan to store them, place them on a baking sheet, not touching each other, and then put the entire tray inside the freezer for about 1 hour. They will harden, but not completely frozen yet. Transfer to a freezer bag and they will not stick to each other anymore. Try not to keep for more than 1 month. So, yes you can still make soft fluffy steamed bao buns without any premixed flour and with just a few basic ingredients you probably already have at home! They won’t be as white as the ones in dim sum restaurants, but you won’t be disappointed either! 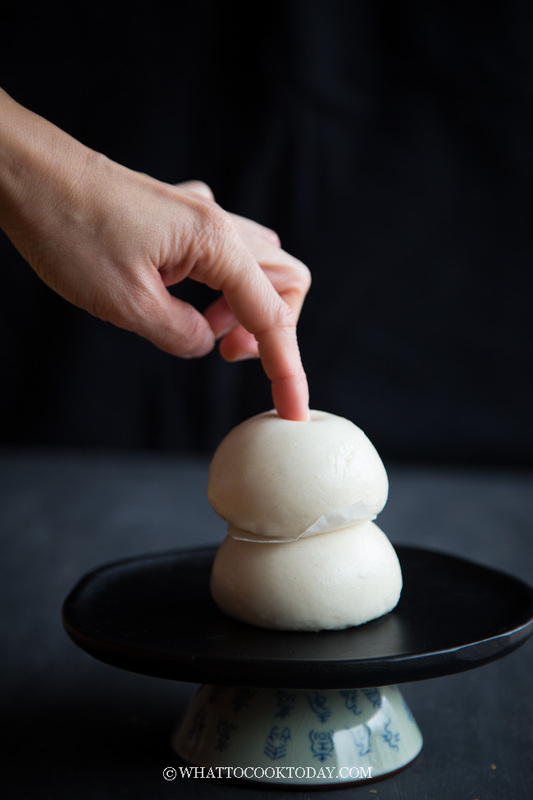 You can now make soft fluffy Asian Steamed Buns at your very own kitchen and important tips you need to know to make ultra smooth steamed buns. You can also use 255 gr all-purpose flour (about 2 1/2 cups) + 45 gr (3/8 cups) cornstarch (or Chinese wheat starch (not wheat flour)) if you don't have cake flour. The texture is not really the same. Both are soft, but using cake flour has an even softer cake-like texture, which I like. It has been a long time since I make bao. Your post makes me want to make it again soon! Steamed buns are my favorite! and i loved the designs you have tried out with them- pure fun! yumboo! I’ll eat it with pork belly for sure, dip them into the sauce. OMG! haha!! This is a great recipe, thanks so much! My only issue: The skin of the finished bao (after steaming that means) always shows tiny bubbles although I make sure to knead the dough very well after the first proofing. 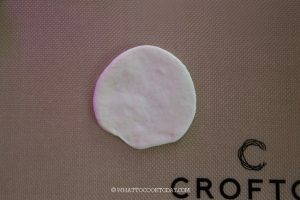 The skin also looks absolutely smooth before I steam the bao. Do you have any idea what could cause those bubbles? Do you remember if you steam the buns over high heat probably? or if any water or condensation dropped on the bun during steaming? I’m more than a little obsessed with perfecting this recipe. I fell in love with Bao about 5 or 6 years ago and have made at least 20 batches. My wife says I need Baozi Anonymous to deal with my addiction. Lol. I have tried many different combinations of dough and fillings and I would love to compare notes! Hi Chef, Ha..ha…Baozi anonymous! That’s a good one! You know…I’m also still continuing to perfect this recipe too. I’d love to hear what’s your favorite combination of dough so far 🙂 I haven’t tried a combination of all-purpose flour and Chinese wheat starch. I’ve seen someone uses it and plan to try it when I get a hold of wheat starch. Then there’s also Hongkong Bao flour that I’ve yet to try too. I changed the flour to Cake flour after reading this recipe. It was indeed soft. Although, I still had some issues with the dough having this glossy outside with some air bubbles. I might have to try again. Hi Ariel, try the shaping technique I share in the post (if you haven’t already) and make sure to start with room temperature water when you make the dough so the yeast doesn’t work too quickly while you are shaping the dough. I’m curious if I’m just missing the actual combining of ingredients for this recipe? Does the 3 tsp of divided sugar get added all at once? Is there a specific order and way to add the ingredients together? From what I see the method just starts at kneading the dough. I made these the other day and just combined everything at once–they came out quite dry, so I’m trying to troubleshoot. Hi Tess, somehow that part of the instruction was missing after I updated the post. It must have accidentally got deleted or something, sorry for the inconvenience. I’ve updated the recipe. Basically with instant yeast, you don’t have to dissolve it in water, so you can put everything in a mixing bowl and then gradually add in liquid (milk or water), I stated 150 ml to start with, you may need to add more until the dough come together and continue to knead for 5 minutes with stand mixer or 10 minutes by hands until the dough is really smooth. Hi Vinni, yes you proof the buns only after you added the filling. You follow the basic recipe until the shaping into smooth bun part no.7 and then flatten the dough with your palm and then use a rolling pin to roll the sides thinner to form a circle with a thicker middle part. This is to support the weight of the filling. I hope this helps. Very good post., will definatetly try it. I have few questions. 1). You have to wait for 1-2 min before removing them. Mmm… sound like I have to turn off the heat and then turn it back on for the next batch. Am I right? Is there a better way to do it? 2). Regarding the storage, do I need to bake them first? Not sure what I did wrong. What kind of flour you use and did the buns puff up a bit (proof) before you steam them? I am using cake flour, and yes it look a bit bigger than original before I steam it. Okay, so at least we know the yeast is working. But you mentioned “stiff”, did the bun have a tough texture? Now I’m also wondering about the level of heat when you steamed this. It has happened to me several times when I steamed on medium heat, they come out not as smooth like the ones you show on your photos, but when I lower the heat close to low, they come out smooth. Hi! Made these tonight. Absolutely lovely. Is there no salt in the recipe? Thank you! I also let the dough proof as I went to the gym for an hour. After an hour I shaped them and let them proof for 15 minutes. Steamed for 15 min. took them out and ate them. The buns were super smooth, soft and pillowy. Next time I’ll add a little salt to the dough for boost in flavor. Hello there, there’s no salt in the recipe, but you can definitely add it if you want too. Thank you for letting me know. Glad to know that you still have smooth buns after proofing the buns twice! Mmm..it was a bit stiff and not fluffy. 1. 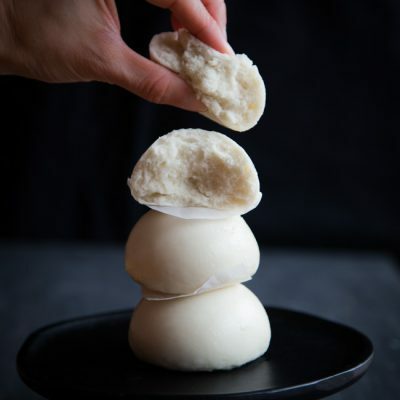 I want to make the buns which are sort of folded over with a gap where to insert filling after steaming – do you think I should shape as you instructed and then perhaps push a chopstick through one side to make a gap or just flatten the dough slightly into an oval and gently fold it? 2. I need to prepare the buns ahead of a dinner party – do I understand correctly that should I prepare and proof the buns and stick them in the refrigerator in the morning, the proofing will be halted? Should I then steam them directly from the fridge or allow them to come to room temperature first? 1. 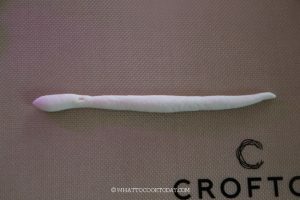 You can use a chopstick or insert a parchment paper in between. Actually, I have tried it without either one and just fold over after roll into oval shape, and I can still open up the buns to sandwich a filling in between after. It’s up to you. 2. Make sure when you put them in the fridge to halt the proofing, you cover it well with plastic wrap or they will dry out and develop a “crust”. Let the buns come to room temperature before you steam them. What good questions you have! Good luck with the party! Please let me know how they turn out for you if you have the chance to do so. Hi! Can I have the measurements in cups and tea/tablespoon, please? Hi Sharon, I’ve updated the recipe accordingly. Hope it helps! Hi!i make my method it have baking powder and my surface some smooth and some crack how to make to smooth all and how many time to steam a big steamedbuns? Hi Vinny, I don’t use baking powder in my steamed buns recipe. I don’t think it’s necessary because the yeast is already doing what it supposed to do, leavening the steamed buns. You can watch the short video in this post on how I smooth the buns and my tips on how not to overproof the buns and to steam the buns on low heat. All these will help to have steamed buns with smooth surface. If I may recommend you read the post if you haven’t already,it will help a lot I think! If I were to fill these buns with custard, when would I do it? Should I fill them then proof or proof then fill? Hi! I want to fill my buns with custard, but I’m not sure when I should do that. Should I proof then fill or fill then proof? Hi Jenny, You will fill the buns and then proof them. Only one proofing needed, and then next step would be steaming. How long does it take to proof the buns until they are 50% bigger in size? You mention how to proof them but not how long? I only have active dry yeast available. Could you elaborate what extra steps is necessary when using active dry yeast instead of instant yeast? Hi Nils, you can rehydrate the yeast in water or milk with 1 tsp of sugar. It will dissolve and be all foamy, about 10 minutes. If it’s not, your yeast is not longer good. You can add the rest of the sugar into the dough later. I hope this helps.